Every year I try to think of things I can make in advance that will simplify the days leading up to our annual after-the-holidays holiday party. This recipe certainly fits in that category. It can be made up to 6 weeks in advance and stashed in the freezer to unexpected guests or a planned gathering. Plus it includes one of the current “it” ingredients, bacon. One added bonus of this recipe is that you can substitute to your hearts content and produce a new variant of bacon bites with whatever you have on hand. Replace the cream cheese with any spreadable medium, switch up the cheese, replace the peppers with salami, or black olives, or gummy bears. Well maybe not gummy bears. Make them your own. Mix together the cheeses until smooth. Stir in the peppers and scallions until evenly distributed; set aside. Trim the crusts from the slices of bread. Gently flatten the bread slices with a pastry roller or rolling pin. Once the bread is trimmed and flattened, spread the slices with the filling, covering it completely. Roll the bread up from the short side, pressing down just enough to make it stick to itself. Take a slice of bacon and wrap it around the roll diagonally, overlapping the bacon to cover the bread completely. If you need more than one bacon slice, tuck the end of the second bacon slice under the end of the first. Trim the bacon when you get to the end of the roll. Place completed roll on a parchment lined rimmed baking pan. When all rolls are completed freeze them for 30 minutes to firm them up. If making for consumption at this time then preheat the oven to 350°F and line a second rimmed baking pan with parchment. If making for later enjoyment, transfer to a large ziptop bag and return to the freezer. When ready to enjoy, slice the rolls in thirds and place on the baking sheet, cut side down. Bake for 30 to 35 minutes until the bacon is crisp and the tops are golden brown. If fully frozen bake an extra 5 minutes. There’s no need to thaw these if you are pulling them from the freezer after they are fully frozen. Just bake an extra 5 minutes or so and they should be good to go. As best I can remember the original recipe I used came from King Arthur Flour’s website. I wanted a bit of sweet-salty crunch with the salad we made as part of our Christmas Eve dinner this year. After bouncing options off my husband I opted for a quick online search where I found this recipe that sounded promising. A bit of on-the-fly modification produced a tasty result. Place a non-stick skillet over medium heat and add the pecans. Toast for about 1 minute, swishing the nuts around the pan frequently. Transfer to a plate. Add the remaining ingredients to the skillet, allow the sugar to melt and swirl to combine the spices. Return the nuts to the pan and toss to coat. Allow to cook for another minute until the nuts are well-coated with sugar and spice. Transfer nuts to a rimmed baking dish lined with parchment or a silicone mat. Spread the nuts out so they don’t touch. Sprinkle with sea salt and black pepper to taste. Allow to cool for 30 minutes and then transfer to a sealable container. Let these cool at least a minute or two before tasting; the sugary coating is lavatastic when it first comes out of the skillet. The name may sound fancy (c’mon, cheese puffs sounds highfalutin to me) however they are simple to make and can be created in many variations. I first had a similar creation, made with fake crab meat, 20 years ago. One of the best parts is that you can make them well in advance and store them in the freezer for up to a month before using. Great when you there are unexpected guests or you are prepping for a big party. Mix the first 6 ingredients in a bowl until fully combined. Place about 2 Tbsp. of mixture on each English muffin half. Spead into an even layer over the muffin. Cut each muffin into 6 wedges. Place wedges on a rimmed baking sheet, cover with plastic wrap and freeze for at least 1 hour. When ready to arrange the oven rack 4-5″ from the broiler. Preheat broiler (use 450°F if you need to enter a temp like I do) for 5 minutes. Transfer half the cheese puff wedges to a separate baking sheet. Bake for 4-5 minutes, rotating sheet once for even browning. Serve immediately. I used jarred roasted red peppers for this as I had them on hand. I removed 2 from the jar and placed them on paper towels to dry them a bit. You certainly can use home-prepared roasted red peppers if you have the time and inclination. If you want to store these rather than bake them off right away then transfer the frozen wedges to a zip top bag after the hour freeze in step 3. They’ll keep for a month (or longer). While these work test with an hour in the freezer you can bake them right after making. They’ll cook up in 1-2 minutes so keep an eye on them lest they burn. I made these for our holiday party this year. 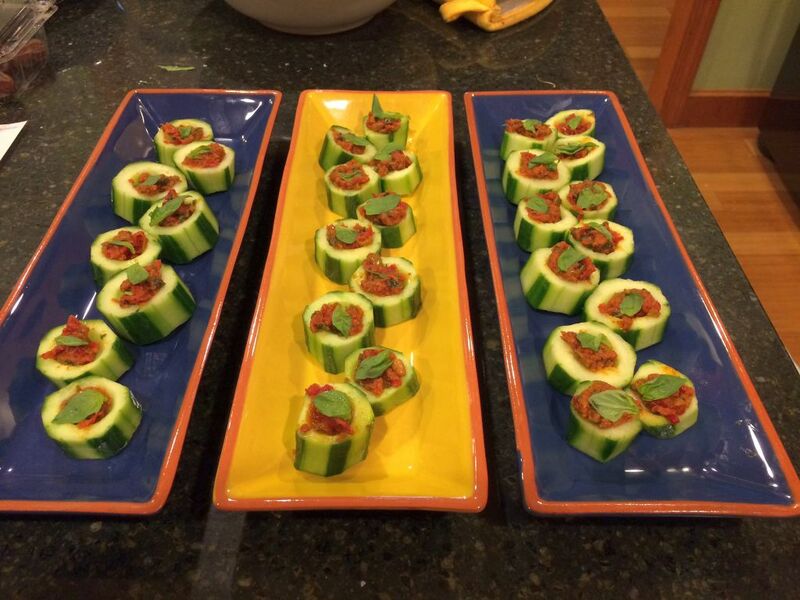 I was in search of a vegetable appetizer, something that was a single bit and savory. I found a recipe titled “Gluten Free Cucumber Slices Provençal” which fit the bill. I’m not sure why the title includes the words “gluten free”. It is gluten free however I can’t conceive of a way to make the dish that would include gluten. Anyway, I made a few changes to the recipe so it fit it to my taste. This chutney can play multiple roles in the kitchen. For our Christmas week festivities it will act as “surprise” companion to creme brulee and a topping for a brick of cream cheese. It could replace the canned cranberry sauce with roast turkey (though there is a special place in my heart for can-shapped cranberry sauce) or cut the delicious fattiness of slow roasted pork shoulder. This recipe is adapted from one Moosewood Restaurant Celebrates. I adjusted the amounts and wrote it up in my own words. Enjoy. Heat oil in a large saucepan over medium heat. Add the onions and cook, stirring periodically, for 5 minutes or until the onions start to become translucent. Reduce the heat to low. Add the cinnamon, grated ginger, cardamon and salt; stir to combine. Cook for another 5 minutes, stirring frequently. Add the cranberries, brown sugar, water and vinegar. Stir until the brown sugar dissolves. Cover and bring to a simmer, about 5 minutes. Remove the cover and cook for 5-10 minutes. The chutney will look more like soup than chutney at this point. The cranberries will pop, soften and thicken the chutney. Add the mango and simmer for 5 more minutes. Remove from the heat and taste for sweet/salty balance. Allow to cool for 1 hour then transfer to a storage container. Will keep in the fridge for about 2 weeks. Frozen fruit (both cranberries and mangoes) should work fine in this recipe. Frozen mangoes will probably disappear into the chutney more than fresh ones. Samosas are basically a potato patty covered in dough. 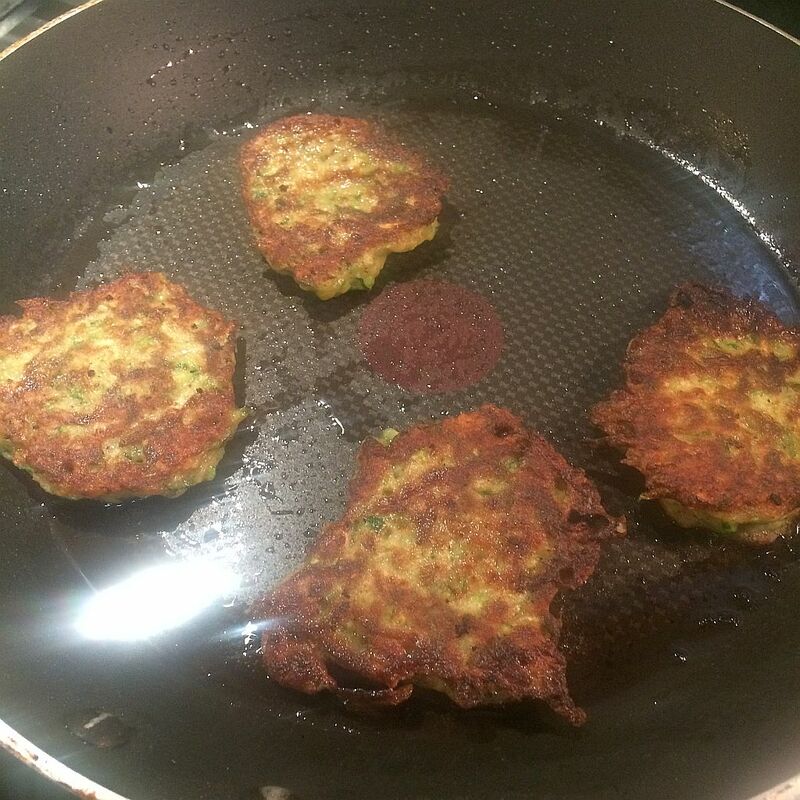 They are typically deep fried and can be served with chutney or yogurt. I made these as part of menu this past Saturday night and wanted something baked rather than fried. I love these fried however I didn’t want to stand next to a pot of hot oil for as long as it would take to cook enough of these to feed our usual crowd. After a bit of web searching I settled on this recipe. 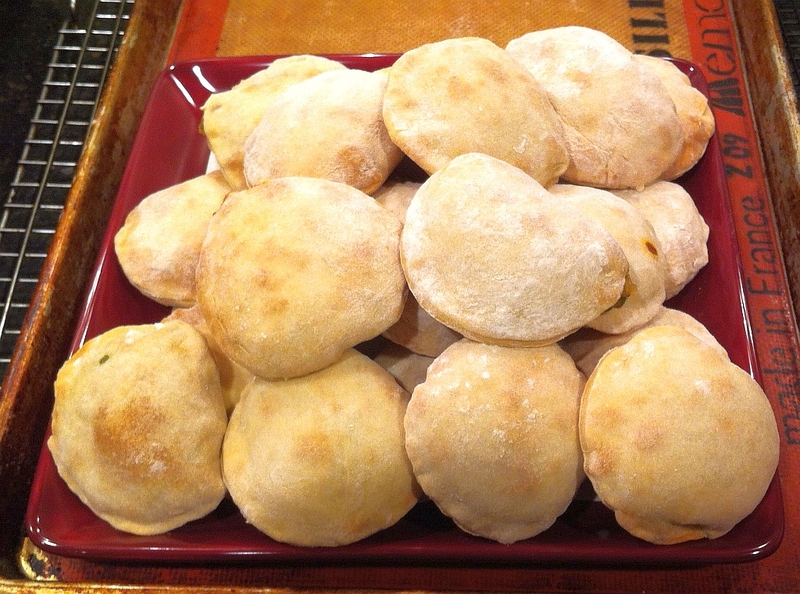 After making several guesses to make up for missing info in the recipe the end result was something that looked a bit like a small pita pocket filled with a tasty filling. All but 3 of 24 were consumed by 8 people, including 3 kids, as part of a large meal. I consider that a success.